Soups who does not love them especially during wet and cold season, they very simple and easy to prepare yet very fulfilling. While a lot may have their favourites I guess this Vegetable Beef Barley would be a crowd pleaser as it’s an all in one meal where you can have your meat, vegetables and grains in one bowl. In a skillet add oil then cook bacon pieces, once brown remove from skillet and set aside. Add the beef then brown on all sides. Remove beef then set aside. Add the garlic and onions then sauté for 2 minutes. Prepare a stock pot then pour all skillet contents together with beef and bacon. Add the cannellini beans, barley, beef stock, water, Worcestershire sauce, chopped tomatoes, dried basil, dried oregano, dried parsley and bay leaves. Bring it to a boil then simmer in low heat for 1 hour. Add the potatoes, carrots, celery, corn kernels then simmer for 45 more minutes. Season with salt and freshly ground black pepper then garnish with fresh chopped parsley. I love barley soup but I’ve never tried a tomato based version. My family’s old recipe is a stock based soup, but I have to say that would be nice! Barley is one of my favorite ingredients for soup. Such a nice smooth texture, and it thickens the soup, too. Thanks for the veggie soup reminder! A beautiful bowl full of flavour. I’ve never used barley for soup. I must definitely try it. 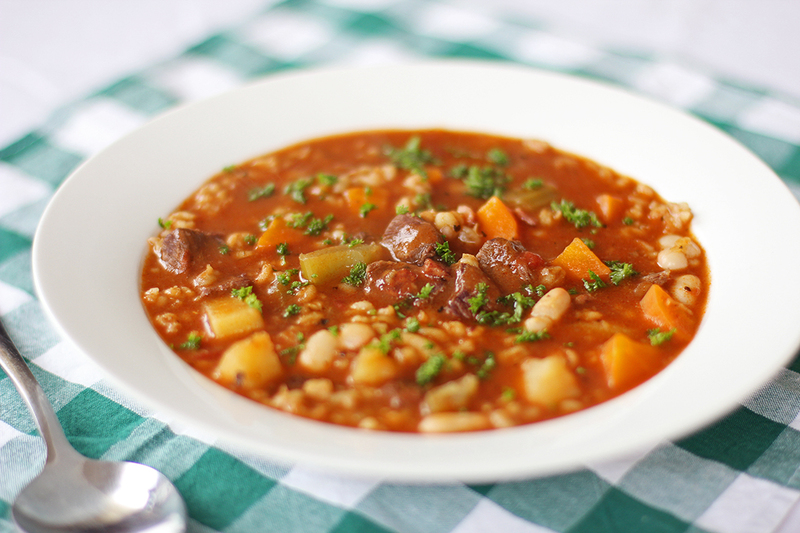 I do love barley and this soup looks so warming and filling. Beautiful comfort food! Lovely color! I make so many variations on this theme, and, often it is a case of ‘dump it in’ if it is there 🙂 ! But barley just has to be there both for consistency and flavour and just its inherent goodness! OMG!! I want this soup (sans the meat, of course). It’s packed with delicious flavors!!!! What a hearty looking soup. So perfect for colder weather. A perfect bowl of soup to warm up to! I have a big beef shin which I want to cook soon – this may be the one-pot recipe I go for ! It’s cold and rainy here. I would love a big bowl of barley soup right now! Love the beautiful colors too. Looks very warming and comforting! Yum, comfort food, come join my soup event….. This looks so filling and delicious! I’m definitely trying it.